The new Volkswagen e-Golf has an NEDC range of 186 miles which makes the car much more useable than the previous model. Mention the name Volkswagen and many people still think of Dieselgate, but to give the brand credit where it’s due, the company is making a real effort to transform itself into a major electric car manufacturer, and although we’re still a few years away from seeing the cars that are currently being developed on sale, the existing e-Golf is already a reassuring indication of what’s to come. The Volkswagen e-Golf is a 100% electric car (unlike the Volkswagen Golf GTE which is a plug-in hybrid). 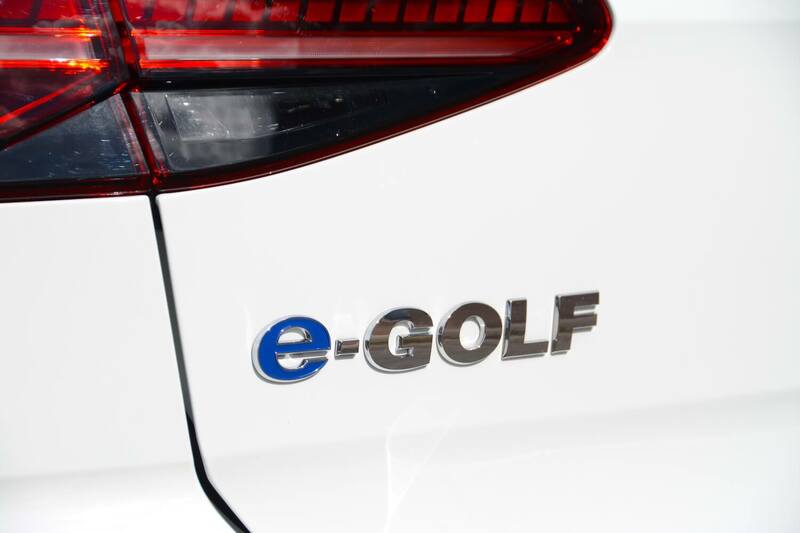 The e-Golf has a 136 PS (100 kW) electric motor, powered by a lithium-ion battery which is integrated into the vehicle floor. A single-speed gearbox delivers drive to the front wheels. The Volkswagen e-Golf looks very similar to any other Golf, with the main exception that the wheels mark it out as an eco model rather than a sporty car. However the overall package remains compact and practical. The e-Golf drives like many other electric cars: it’s quiet, smooth, and refined. It has excellent acceleration thanks to the torque that’s available 100% of the time, and it’s easy to drive. 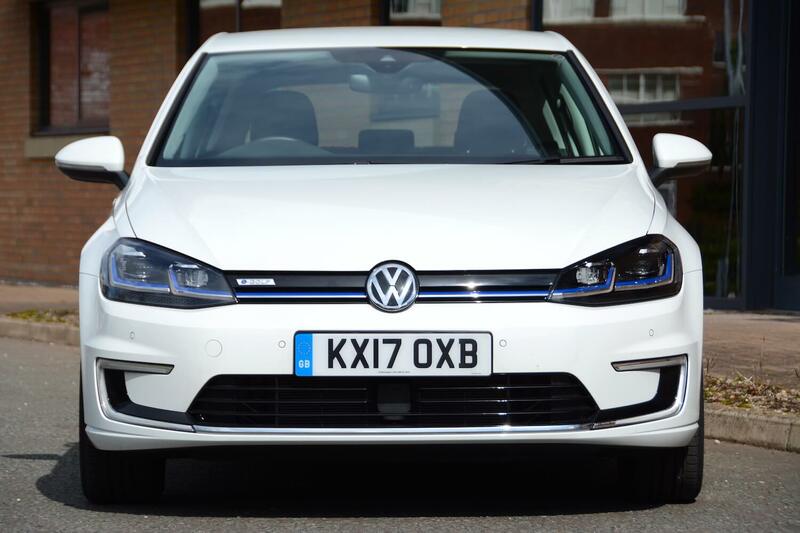 The 345kg battery sits very low down in the car’s floor, which aids handling, and the e-Golf has a comfortable ride. If you invited owners of 10 year-old diesel Golfs to test the e-Golf, they would be amazed at how good it is to drive. There really is no better car to use around town than an electric car such as a Golf. 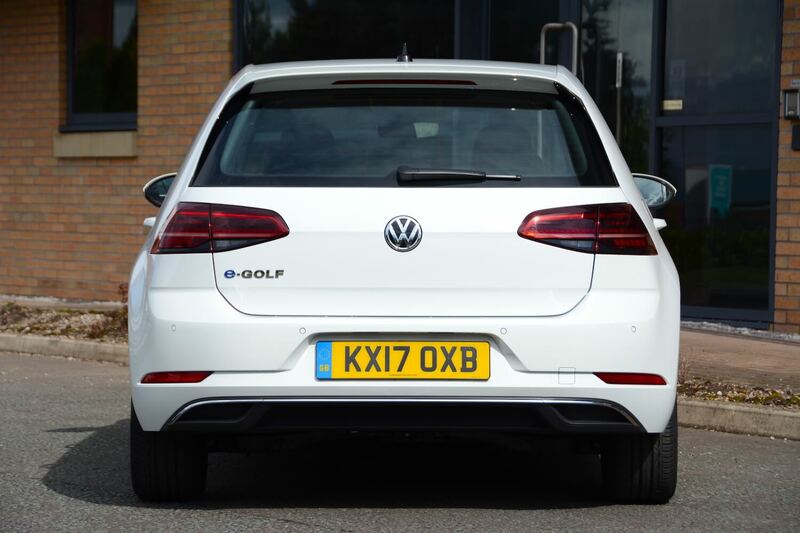 However thanks to its increased range, the new e-Golf can also face motorways much more confidently than the previous model. 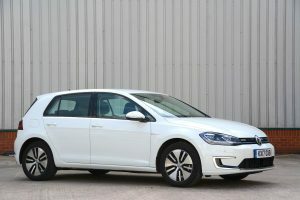 So if many electric cars have similar driving characteristics, what’s different about the e-Golf? Well, it’s a Golf. That in itself might be enough of a sales proposition for many buyers. 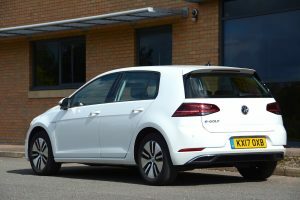 Apart from being a practical five-door, five-seat, family hatchback, being a Golf means that it’s a quality package overall, and everything should work just fine. Well, maybe apart from one thing: the drive mode switch. This may be positioned conveniently for left hand drive cars, but for right hand drive, the button is obscured on the left of the gear selector, so you can’t really see it. If you do find it, it gives you the option of Normal, Eco, or Eco+ modes. Note that there’s no Sport mode. The Eco setting is designed to conserve battery range, cutting peak power to 95 PS, reducing the output of the air conditioning system and modifying the accelerator response. Top speed is cut to 71 mph and 0-62 mph takes 13.4 seconds. Eco+ limits maximum power to 75 PS, torque to 175 Nm, and top speed to 56 mph. The accelerator response is modified again, and the air conditioning is disabled. You can also change the amount of regenerative braking. If you move the gear selector to the left you can access three modes: D1, D2 and D3 (we’d be interested to know how many e-Golf drivers are aware of this, as it’s not that obvious). If you move the lever to the right it takes you back into D (ie. recuperation is off). You can also pull the gear selector down to choose the B setting. By increasing the level of regenerative braking you can put more energy back into the battery and increase the car’s range. But it’s also useful if you want to simulate the effect of changing down a gear eg. for a downhill corner. In D2, D3 and B, the brake lights are activated when the driver’s foot is lifted from the accelerator pedal. Aside from the hidden drive mode switch and the secret way to adjust the level of regenerative braking, the interior is mostly standard Golf. This means that it’s functional if not very exciting. The Golf has recently had a refresh, although most people would be hard pushed to notice many significant changes, but one new feature is a larger touchscreen with sharper graphics. The mapping on the satnav is very clear, showing details such as individual rows of houses and even runways at airports. To access functions such as the radio or satnav you have to press two buttons – menu and home – at the top left of the touchscreen. Systems such as BMW’s iDrive are better as instead you can just press one shortcut button. However the Golf’s climate controls are separate from the touchscreen, which is a good thing. 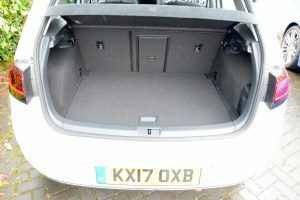 Another good point of the Golf, that many electric cars don’t have, is a compartment under the boot to store the charging cables. 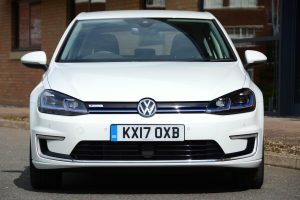 The official NEDC range of the e-Golf is 186 miles, although interestingly Volkswagen quotes a real-life range of 124 miles. This is interesting because Volkswagen appears to be under-selling the car by doing this, as we consistently achieved a real-world range of around 150 miles on a full charge. When we tested the previous Volkswagen e-Golf we were getting a range of around 100 miles in real life. A real-life range of 150 miles rather than 100 miles makes an electric car so much more useable, especially if your driving takes in occasional motorway journeys. You can charge the e-Golf from a standard household three-pin socket, but a full charge takes 17 hours. A 3.6 kW home wallbox can recharge a fully discharged battery in 10 hours 50 minutes. 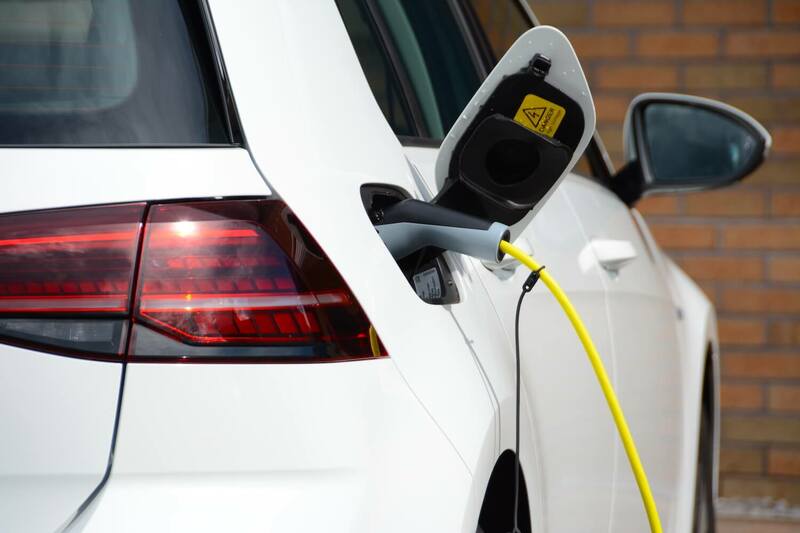 Using the e-Golf’s combined charging system (CCS) and a DC supply, the battery can be fully recharged to 80 per cent capacity in just 45 minutes. The Volkswagen e-Golf costs £32,190, or £27,690 after the £4,500 government plug-in car grant. Our test car had the following options: keyless entry (£365), Lane Assist Plus with Dynamic Light Assist (£1,225), and Pure White paint (£280), taking the price as tested to £34,060. The e-Golf comes with 8 year/99,360 mile battery warranty. Of course there is a bewildering array of other Golf models to choose from, with petrol, diesel and plug-in hybrid powertrain options. 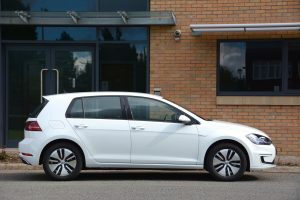 The Volkswagen e-Golf is an excellent car to drive, being quiet and refined, with smooth, linear acceleration, and a comfortable ride and good handling. With five doors and five seats, it’s also practical and very easy to live with. The most significant improvement over the previous model is the real-life driving range, which has increased from 100 to 150 miles. 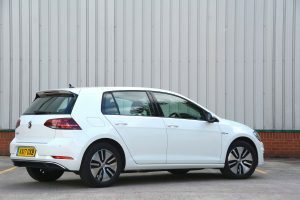 This makes the e-Golf a much more viable car choice for many people; in addition to being an ideal car to drive in the city, it can now handle motorway driving much more confidently. Add in the fact that it has just a 9% company car Benefit in Kind tax rate, and it looks even more attractive. So the Volkswagen e-Golf is awarded a Green Car Guide rating of 9 out of 10. 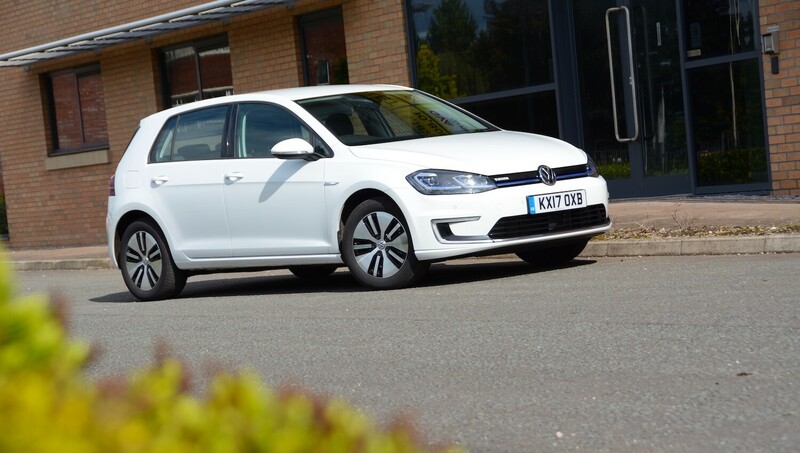 We’d be happy with the e-Golf as our own car, as it would be ideal for day-to-day domestic duties such as the school run, but we need to remember that the e-Golf is just a taste of what Volkswagen has planned for the coming years in the area of electrification.